“The first exposure is to a video ad featuring the movie’s trailer. If the user watches the trailer, he will later be targeted with a direct-response ad calling him to purchase a ticket to the movie online. But if another user doesn’t watch the video at the first exposure, she’ll be targeted with the video again—on a different device, in hopes that reaching her in a different way will make a view more likely. If she still shows no interest in the video, she won’t be touched with that campaign again, whereas if she does watch, she’ll later be invited to purchase a ticket. And the report shows that videos optimized for Facebook also performed well on Instagram, which is good news for brands with more limited resources. Wondering if influencers are worth the investment? 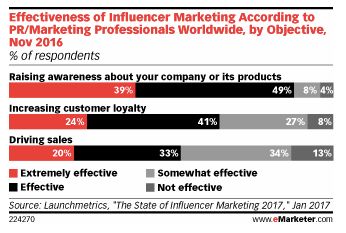 eMarketer covers that very question in Here’s Why Influencers Are Making Bank.